Penn’s power begins with the students and scholars who apply their intellectual curiosity, academic rigor and collaborative spirit to address complex challenges. They are joined by a worldwide network of loyal alumni and the parents, patients, friends and partners who share a passion for Penn and give of their time, knowledge and resources to propel the University’s mission forward. Whether you visit campus to participate in annual favorites like Homecoming Weekend and Alumni Weekend, attend a Power of Penn Campaign event or faculty lecture in your home city, or explore the world through Penn Alumni Travel, attending Penn events inspires life-long learning and keeps you meaningfully connected to the University. Support The Power of Penn Campaign through an annual gift. Annual giving provides resources equal to the return on a $1.5 billion endowment, so you can make a significant, ongoing impact at Penn by giving every year. 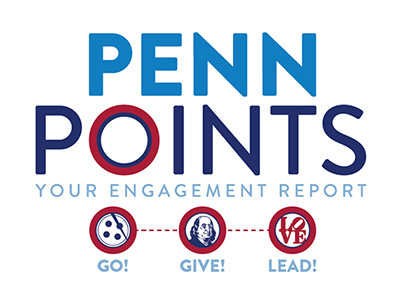 Volunteer your time and expertise and help Penn engage its community and the world. Sign up for the Alumni Interview Program. The University is committed to offering an alumni interview to every undergraduate applicant. Interviewing potential Quakers increases access to Penn by allowing applicants to advocate for themselves and share their stories and capabilities. Be a Key Quaker Social Media Ambassador. Penn is building an online community of proud alumni advocates who want to keep themselves and others engaged with news, events and updates from across the University. Get involved with your Reunion Class or Regional Club. Interested in getting back in touch with your undergraduate class or meeting local Quakers through our network of over 120 alumni clubs around the world? Alumni events provide a wide variety of social, educational and cultural events for connecting with your fellow alumni.